Vladislav Voziyanov and colleagues have developed and shared the TRIO Platform, a low-profile in vivo imaging support and restraint system for mice. In vivo optical imaging methods are common tools for understanding neural function in mice. This technique is often performed in head-fixed, anesthetized animals, which requires monitoring of anesthesia level and body temperature while stabilizing the head. Fitting each of the components necessary for these experiments on a standard microscope stage can be rather difficult. Voziyanov and colleagues have shared their design for the TRIO (Three-In-One) Platform. This system is compact and provides sturdy head fixation, a gas anesthesia mask, and warm water bed. 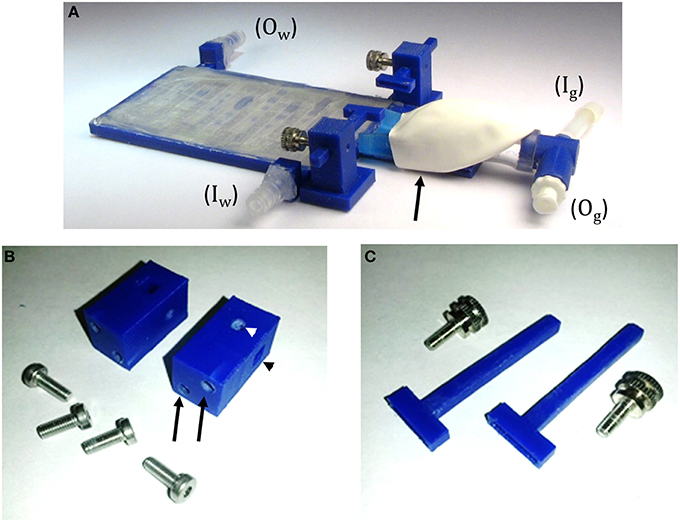 While the design is compact enough to work with a variety of microscope stages, the use of 3D printed components makes this design customizable. Read more about the TRIO Platform in Frontiers in Neuroscience! The design files and list of commercially available build components are provided here. In Current Protocols in Neuroscience, Alexander Jacob and colleagues share their open source compact head-mounted endoscope (CHEndoscope) for imaging in the awake behaving mouse. This miniature microscope device is designed to provide an accessible set of calcium imaging tools to investigate the relationship between behavior and population neuronal activity for in vivo rodents. The CHEndoscope is open source, flexible, and consists of only 4 plastic components that can be 3D printed. It uses an implanted gradient index (GRIN) lens in conjunction with the genetically encoded calcium indicator GCaMP6 to image calcium transients from hundreds of neurons simultaneously in awake behaving mice. The aim of the open source model is to provide an accessible and flexible set of calcium imaging tools for the neuroscience research community. The linked article describes in depth the assembly, surgical implantation, data collection, and processing of calcium signals using the CHEndoscope.